Posted: Tuesday 29th April 2014 in Events and Awards, News. innovative business leaders across all industries. This is not the first time Hedley’s entrepreneurial prowess has been recognised; he was named one of Insider’s ’42 under 42’ in 2008.
a business that, 13 years later, hires 140 staff and turns over £40 million annually. It’s his ability to challenge the norms combined with endless optimism and energy that has driven the business to grow and inspired the company brand ethos of Changemakers in Retail. The awards are held in more than 145 cities and in more than 60 countries worldwide, starting locally with interviews, a regional judging panel and celebration event. Winners will be announced at the event, which occurs in June, including the overall regional Entrepreneur of the Year. All regional winners then progress to compete at the UK finals. The awards are in their 28th year globally and 16th year in the UK, with previous winners including Jeff Bezos from Amazon, Howard Schultz from Starbucks, Larry Page and Sergey Brin from Google and creator of Angry Birds, Mikael Hed. Hedley is in good company for the north region, competing against Mahmud Kamani from boohoo, Kevin Brennan from Quorn and Jon Wright from Xercise4less, among others. 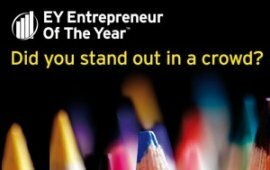 Check out the full E&Y Entrepreneur of the Year shortlist for the north, and watch this space to find out if Hedley can progress to the UK finals in June. You can also view all of Summit’s recent awards and accreditations.